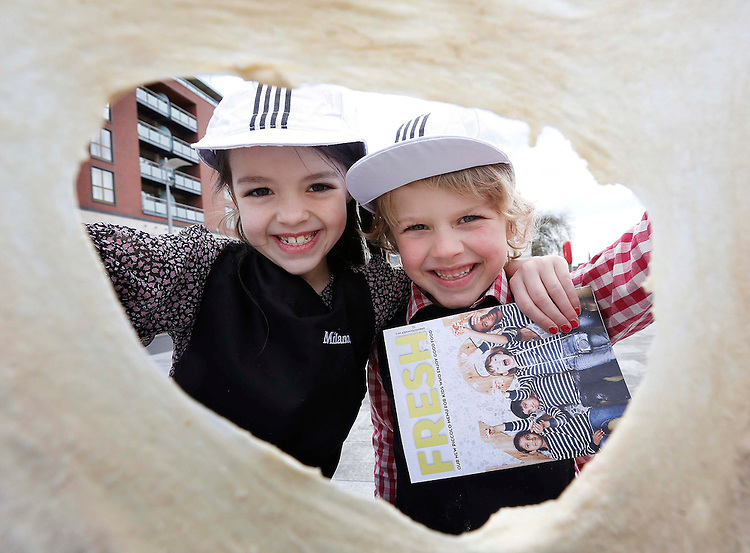 Milano re-launch of Piccolo kids menu..No Repro Fee..Ava O' Kearney, age 7 from Lucan, Co. Dublin and Cillian Lynch, age 6 from Dundalk, Co. Louth, pictured at the re-launch of the Milano Piccolo Children's Menu at the Milano restaurant at the Grand Canal, Dublin. Pic. Robbie Reynolds..Designed to look like a mini magazine, the new Piccolo menu for ?8.50, which includes four courses, is created to engage with kids using an activity page. Kids can create their own pizza, adding or removing ingredients with the option to upgrade to a Romana base (thinner, crispier) for only ?1.25. Seed packs are also handed out so kids can grow their own herbs at home and use them in fresh cooking!..Visit a Milano restaurant near you, visit www.milano.ie for more details. .